Note - all the Ricketts listed on the IGI record, batch nos. C135262 and M135262 belong to this family group. These records, taken directly from parish registers are now far less obvious since the LDS reorganised their site, and gave equal prominence to those derived from submitted trees. All details should be checked from original parish records, wills and more because so many duplicates with similar dates and ages can occur that it's quite easy to be completely mistaken! In the next twenty years of marriage William and Sarah had ten children, all born and baptised in West Clandon. The first two died in infancy and two more at least died as children. Mary Ann Ricketts chr 13 Aug 1815. She died within the month and was buried on 28 August. Mary Ricketts b 16 Jan 1818 chr 22 Mar 1818 d Jul 1820 bur 25 Jul 1820. Maria Ricketts b 8 May 1826 chr 4 Jun 1826. m James Woods, brother of her sister-in-law Ann (William's wife) on 5 Nov 1843. Richard Ricketts chr 20 Dec 1835 m 28 Aug 1859 Rosanna, Holy Trinity, Guildford. William Ricketts senior died and was buried at West Clandon on 30 Dec 1841, leaving Sarah with her youngest four children aged 13, 11, 8 and 6. The family had by then moved to nearby Merrow. In 1845 Sarah married again, to a John Worsfold, born in 1792 in West Clandon. 3. The marriage of William Ricketts junr to Ann Woods (1815-1862) was the first connection with the Woods family who must have played a large part in their lives. William and Ann had seven children, William chr. 1842, Mary chr. 1843, James 1845-1847, Louisa b.. 1848, Ann chr 1851, Elizabeth chr 1854, and George chr 1858. ___(ii)Mary Ricketts married Henry Hyde of East Clandon (b.1826) and had 4 children, the first two initially 'Ricketts' before the marriage in the Dec Q 1866. .............................. Lucy Hyde (chr. 2 Nov 1862, W.Clandon), m. George Mullins (b.1858, East Clandon) and had a son Harold (Dec Q.1899 Guildford). .............................. Annie Hyde (b.1863, Guildford), m. Harry Deedman (b. 1861 Normandy Sry) in the Dec Q 1880 and had 4 children, Henry 1881, Annie 1883, Kate 1885, and Alice 1887. ___(iii) Louisa Ricketts has now been found in 1881, aged 32 (and deaf), and living with her aunt Elizabeth (nee Woods) and uncle William Searle (Elizabeth's husband ), working as a laundry maid; also there was her cousin Mary Ann Woods (b.1865). Nothing more is known at present. ___(iv)Ann Ricketts married William Martin and had two sons, William G. Martin (1875, Woking) and Arthur H.Martin (1877, W.Clandon). 6. Maria Ricketts (1826-1884) m. James Wood, brother of her sister-in-law Ann, on 5 Nov 1843 and they had 10 children: George (1847) m. Jane Glaysher; James 1849; Thomas 1851; Henry 1852; all born in West Clandon. In the next 3 years James and Maria moved to 'Smokey Hole' where James worked as a brick burner on Merrow Common (with that address no more description is needed!) the rest of their children being born there. : John 1855; Robert 1856 m. Sarah Parsons in the Mar Q 1889 (their dau. Elizabeth Violet- eldest of 10 children - married & emigrated - more details available) ; Frederick 1860; Peter, 1862; Sarah 1864; and Louisa 1867. 8. New Elizabeth Ricketts b.5 Sep 1830, chr. 3 Oct.1830. After leaving home she worked briefly as a dressmaker living in Kensington (hamlet of Brompton) before marrying William Cooke-Browne (their son John wrote it with a final 'e' on the 1911 census). William was born in Gloucester in 1831 and was a clerk in the Chancery Pay Office.. They were living in 1861 in Kensington and then in Kingston on Thames in 1871, though they have the extra distinction of bi-location by also being recorded at the house of James Woods and Maria, Elizabeth's older sister (above) and Sarah now Worsfold, their mother (formerly Dyer/Ricketts)! The one essential piece of information missing is the time and place of their marriage which was between 1851 and presumably 1856. ___(i) John Browne Browne appears as single in 1881 with his parents and 'no occupation', b. in Merrow in 1856 m. Kate Over in the Dec Q 1882 [Oxford Vol.3A p.?1149] They have not been found afterwards until 1911 in Walton on Thames. They had 3 daughters, all still 'at home'. None of the family were in employment and they were living on private means since at least 1891. ___(ii) Helen Elizabeth. Browne b. Mar Q 1857 bilocated in both Kingston and Merrow (as above) in 1871. In the last Q of 1879 she married Anthony Darnell, a traveller in Leysell Asphalts, in the Strand. [Strand Vol.1B p.982] Like their Browne cousins above, by 1911 they were all living 'on private means'. One further point of interest with the Brownes is their close association with 'Lime Grove Norman/Noman Lodge' in Kingston. Perhaps they inherited this property which the 1911 census describes as having 9 rooms. The double 'Browne' - 'Browne Browne' - goes back to John Browne Browne born in 1793 whose wife had the very distinctive name of Decima! The spelling is shown on birth records, but not often on the census unless probably the person giving the details to the enumerator insisted on it. Although not relevant to the Ricketts in general the 'oddities' would be worth exploring a little further. 9. & 10. George and Richard Ricketts, youngest 2 of the family, moved in with their sister Maria (#6), in 1845 in West Clandon when their mother, now widowed, remarried to John Worsfold. George was still lodging with Maria in Smokey Hole in 1861 and working as a farm labourer in West Clandon, not far away. ___(i) Rosanna b. in Stoke-next Guildford and chr 28 Aug 1859 at Holy Trinity, Guildford who married George Trigg and had 2 children George 1880-1914 (who died at Ypres) and William. George Trigg junr m. Ethel Worsfold (possibly related to John Worsfold above) in 1909 and they had 3 children, one of whom married a Simpkins. A few more details are available. ___(ix) William 1877-1879. The frequent change of address seems to have been one of the problems of renting, probably being forced on them rather than from choice. So many Ricketts and their relations were living in Merrow at the same time that a slight diversion into the other families is useful before continuing with the rest of Henry's family history. All the dwellings concerned were close to the estates of Lord Onslow. Eliza may have been Henry's 3rd cousin, but the evidence is still speculative. (See the Dyer page) He also moved to Merrow and lived near his older brother William. On the 1861 Census they are listed as living on Merrow Common with two unmarried Dyer brothers, John aged 64 and Thomas aged 66 as lodgers. These Dyers were presumably Sarah's uncles who were living on Merrow Common in 1881. Henry, now 56 and Eliza, 58, had one unmarried daughter still at home, Mary Ann, 23. Henry, described as a carman on the 1861 census is listed as an agric.lab.on the 1881 census. They also had a visitor, Frederick Day, 22, unmarried, and by occupation a gamekeeper. (He was a little younger, actually being born in the Sep Q 1861). He married Mary Ann, their youngest child in the Jun Q 1881. He does not appear to be related to the other Day family below and gives his birthplace every time as Oakley (in the district of Tendring) Essex. Frederick and Mary Ann had 10 children, three of whom had died by 1911. Details below. Next door to the Ricketts (up) was Benjamin Day, a carpenter aged 73 and born in Clandon. His wife Hannah, 77, was born in Merrow as were their two children living with them, John, aged 45 and also a carpenter and Hannah their unmarried daughter of 38. There was also Harry Day their grandson, a carpenter's apprentice aged 14 and a granddaughter, Edith Day aged 11.It was thought at first that Frederick might be a grandson but this family seems firmly rooted in Surrey. George below however is shown on the 1851 and 1861 censuses as his son, though oddly as aged 1 and then aged 16. He was actually born in the Dec Q 1844 and the marking in 1851 of the supposed figure 1 is ambivalent, especially as he must have been aged 6. Next door to Henry & Eliza (down) were the Woods/Ricketts family of Smokey Hole. This was the household of James, brother of the Ann Woods who married William Ricketts junior. In 1841 he was recorded as living in the Earl of Onslow's Lodge. In 1881 James was described as 66, an ag.lab. born in Fetcham, Surrey and his wife was Maria (Ricketts) aged 56, born in Clandon. James and Maria had four children at home, John 26 and unmarried, was deaf and worked as a shepherd, Frederick was 21, Peter at 19 was a blacksmith's apprentice and Louisa was 14. Sarah Jane chr 6 Jun 1847 in East Clandon. Emma chr.14 Jan 1849 Merrow, m. Samuel Janes Janes 18 Oct 1868 at St Nicholas's, Brighton . Jane b 1855. Nothing else is known at present. Mary Ann chr 31 Jan 1858 Merrow. She was still at home on the 1881 Census. In 1861 Henry & Eliza were living in Merrow. Henry is described as a carman and Eliza as a charwoman. (She signed with a cross 'her mark' at their marriage) They had 5 children at home, George, now a farm labourer aged 15, Elizabeth 10, William 8, Jane 6 and Maryann 3. By 1881 only their daughter Mary Ann was still at home but she married Frederick Day, a visitor at the time of the census, a short while after (i.e. Jun/Q 1881). 1. Some confusion was caused for a while because Eliza wanted to call her first son Charles, the name that appears on his birth certificate at 3 days old. But two months later he was baptised as George. The rest of his story continues below. One point of interest relevant here is that George worked as a 'carman' and left some tracks of his journeys in the records of his children's births and in censuses after 1861. He must have been the link for his sister Emma (#.3) born in W.Clandon marrying his brother-in-law Samuel James Janes of Brighton. 2. Sarah Jane, aged 14 in 1861, was as thought, in 'domestic' service in Sidney Rd Stoke (Guildford) in the house of John Croach, an ag.lab. with 4 children. The death in the Mar Q of 1865 in Guildford is probably her, entered as in 1861 just as 'Sarah', not 'Sarah Jane'. 3. By 1861 Emma had left home to live with her 'grandparents' John, now a bailiff, and Sarah Worsfold in Merrow, working as a 'house servant'. (It was of course only Sarah née Dyer who was her grandmother,. John being her 2nd husband) In 1861 Samuel James Janes, son of James Janes and Emma Wood, and only full brother to George's wife, Emma Grace Janes was working as a fishmonger's assistant in Brighton. He and Emma Ricketts married on 18 Oct 1868. So Emma Ricketts became Emma Janes and Emma Grace Janes had become Emma Grace Ricketts 3 years previously, a particularly confusing scenario if the name 'Grace' is not included! 4. Elizabeth was still at home, aged 20, on the 1871 Census but she married James Newton of Watford, Herts, on 30 Sep 1871. They both signed their names and their witnesses were George Ricketts & Emma Grace. They had seven children, William James (1872-1873), Albert (1874), Isaac (1876), Frederick John (1879), Sarah Elizabeth . (1881), Alice Mary (1883) and Ernest (1885). ___(i) Albert, a groom, bricklayer and general labourer in succeeding censuses m. *Anna Maria Butcher Jun Q 1903 and they had 2 daughters, Susanna Elizabeth, 1904 and Anna Maria in 1907. ___(ii) Isaac, a general labourer and then in 1911 a cowman (dairy) m. Ann Grover and had 2 sons, Ernest George 1903 and James Henry 1906. ___(iii) Frederick, ag.lab. then carman to a corn chandler, and labourer in 1911 m. Annie Miriam Cannon/Channon (b. 1880, dau. of Edward - not as far as is known at present related to Eliza Cannon, Frederick senr's grandmother) in the Jun Q 1902 in Kingston on Thames and had 3 children, Frederick 1903, Albert 1905 and Annie 1910, living in Thames Ditton Council Offices. ___(iv) Sarah Elizabeth was a parlourmaid in Twickenham in 1901. In the same household was *Anna Maria Butcher b.1871, cook to the then large household, who married her uncle Albert (above) in 1903. Sarah m. Alfred George Bartlett, a 'head porter draper' in Guildford in the Jun Q 1906 but had no children before the 1911 census when they were living at 16 Gardner Rd, Guildford. ___(i) Emily Elizabeth b. Jun Q 1875 at Carisbrooke IOW; m. George Gilbert from Arundel; 2 children, both b. in Portsmouth, the first died and Stella b.Dec Q 1910. ___(ii) William Henry J. b.Jun Q 1877 Newport IOW; m. Kate Neaves of Teddington; 2 children, William Arthur Ricketts b.1898 in Teddington, and Elizabeth Ricketts b. Mar Q 1900 in Teddington. Meanwhile William in 1901 was back by himself in Worplesdon as a 'farm labourer' and living or just staying at the Horseshoe Inn, 'married' but without Emily. Then in 1911 he was boarding at 90 Addison Rd in Guildford, now listed as 'single'. Emily in 1901 was living in the household of a family called Long in Portsmouth, with the Gilberts listed as visitors. A death record has been found for William in the Dec Q 1816 in Guildford, Sry but Emily who was not living with him or with her daughter Emily and family in 1911 has not yet been positively identified in that census, though she could be the Emily Ricketts who died in the Mar Q 1915 in Christchurch, Hants, but this has yet to be proved. 6. At Peace Cottage, Merrow St, at the time of the 1881 census were 2 lodgers, James Ricketts, 25, and John Daws, 24, from East Clandon. Both were ag. labs. James, 3rd son and 6th child of Henry Ricketts and Eliza (Cannon), married John's sister, Elizabeth Daws on 29 Jul 1882 in St John's. Merrow. In 1891 they were living at 3 Swayne's Cottage, Merrow and Elizabeth's grandmother, Msry Lawrence, a widow of 89, was lodging with them and their 3 children, Edward Henry (1884-), Norah Elizabeth (1885-) and Agnes Jane (1886). James Ricketts and Elizabeth [Daws] were still in Merrow in 1901 but now on 'Merrow St' with James described as a wood dealer. Another change of job in 1911 finds them at '[The Hare Warren' in Merrow, with two of their children and a granddaughter Phyllis Ricketts b. Burgham, Sry in 1905, perhaps Agnes's daughter as Edward at 26 was still single. James was then working as a gamekeeper; and Edward as a gardener; the name of the property suggests an estate so his living quarters, comprising 5 rooms, may have gone with the job. ___(i) Edward Henry Ricketts m. Florence Lucy M. Scarlett in the Dec Q 1919 in Guildford. ___(ii) Norah Elizabeth Ricketts b. 1886 Merrow, m. Frederick John Kemp b. 1884 Thames Ditton, in Sep Q 1910 in Guildford and they had one daughter, Winifred Eira Kemp 3 mths old at the census b.at Cefn, Brecon, presumably in January that year. At the census time they were 'visitors' with a Welsh family, Rogers, in Merthyr Tydfil, Frederick being described as a 'general labourer'. ___(iii) Agnes Jane Ricketts was perhaps the mother of Phyllis Eliza Sarah Ricketts living with Elizabeth and James (and identified as their granddaughter) in 1911 aged 6. She was born in the Dec Q 1904 in Burgham but this hamlet is part of Worplesdon and therefore comes under the umbrella of Guildford for the records. Elizabeth (née Daws) d. Jun Q 1918 aged 56 and James Ricketts d. Dec Q 1932 aged 77, both still in the Guildford district. ___(vii) Ernest Christmas Day b. Mar Q 1899 Godstone Sry; b. that day 1898 & registered in Jan 1899? ___(viii) Gladys Laura Amelia Day b. Sep Q 1900 Brampton, Cumberland. The last 4 were still living at home in 1911. 3 of the ten children had died (inc. one of first 4). The other 2 could have been born and died in the 'gaps' above (1882-6 & 1889-1893), and missed any census. Henry died in the Mar Q 1892 and Eliza in the Sep Q 1900 [Guildford Reg.Dist.] their last address still being Merrow on the 1891 census so presumably they both died there. Perhaps George worked as a carman at some time in his career. It seems odd that he should have met his wife in Brighton and married there, the Ricketts family having stayed near Guildford previously as far as is known. His movements from then on are quite complicated as he and his growing family travelled backwards and forwards. In Brighton in 1868 when his daughter Fanny was born he was described as a 'street lamplighter', but on all other occasions he was a farm labourer or general labourer. Arthur William Ricketts b. 1884 m.
Emma Grace Janes had one brother (and half-brothers, details on the Janes Family page). Samuel James Janes was born in 1847 but not baptised until 1 Sep 1850, his father, James Janes having died the previous May. Three years after his sister Emma Grace married George Ricketts Samuel married Emma Ricketts, George's sister, on 18 Oct 1868 in St Nicholas' Church, Brighton, the same church. Thus Emma (G) Janes became Emma (G) Ricketts and Emma Ricketts became Emma Janes! The frequent moves of George & Emma Grace - up and down the road from Guildford to Brighton - can be tracked through the censuses and the birth of their ten children. The Ellen born in 1865 has been found in the 1881 census and was not a member of this family. This note will be removed later. 1. Emma Eliza was born in Brighton in 1867. Along with two of her siblings she was not baptised until 13 Dec 1872 being then 5 years old, in Holy Trinity parish church in Guildford, Surrey. By the age of 14 in 1881 she seems to have been working for Henry Jones, butcher, as a general domestic servant, at 16 Gardner St in Brighton. She married William Henry Hawthorne in the Mar Q 1891 in Guildford (presumably actually in Merrow). Her daughter Elizabeth (Maggie) Hawthorne married George Mears, had four children, and they eventually moved to Byfleet. Regular contact was maintained for over 100 years with this branch of the family and there are descendants scattered from the Orkneys to the USA. 2. Fanny Elizabeth Ricketts was born on 9 Apr 1868 in the sub-district of St Peter's in Brighton. This was still in the same area, the church being fairly new and taking a 'slice' of the parish of St Nicholas but Fanny was not baptised there, waiting, like Emma, to return to Merrow. Back in Merrow she and Emma stayed with their Ricketts grandparents in 1871. Fanny was baptised on 24 Nov 1872 at Holy Trinity, Guildford, about three weeks before the other three late baptisms of Emma, Sarah and George.! ___(i). Elizabeth Margaret b. 1895, known to the family as 'Cis' and lived with her younger sister #5. ___(ii) George Albert b.1896 emigrated to Australia in April 1914. He m. Margaret McDermot Hutchinson in Ballarat in 1917 and had one son, George Arthur who had six children. His descendants still mostly live in or around Melbourne. ___(iii). Arthur William b. 1897 (presumably named after Fanny's brother who died at 10 in 1894), became a Franciscan priest and took the name Hugh by which he was known from then on. He d. 1952. ___(iv) Thomas Frederick b. Dec Q 1898 d. Sep Q 1899 at abt 5-6 mths old. ___(v) Minnie Pretoria b. 1900 (just after the Relief of Pretoria in the Boer War (at which their cousin Thomas Taylor was present) was known to the family as Tor (or Mary at work). She was named Minnie after her father's half-sister , mother of Tom Taylor (who was probably really baptised at Mary). 'Cis and Tor' were usually always together though a couple of times Tor acted as companion to a Mrs Monk and visited Jerusalem and Rome with her. ___(vi) Harold b. 1906 attended Westminster City School (where his brother-in-law Walter was also a pupil but about ten years earlier) and then studied at Northampton Polytechnic to become an ophthalmic optician. He m. Amy Barnes in 1930, had 3 children; and worked until near retirement in Aldersgate St. They lived in Thornton Heath, not far from Cis and Tor who were always 'part of the family'. 3. 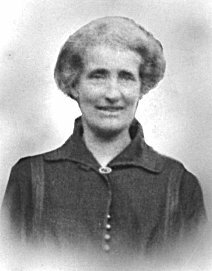 Sarah Jane Ricketts was born in 1869 in Brighton and was about three when she was baptised at Holy Trinity, Guildford on 13 Dec 1872. She married Harry Nicholls or Nicolls from Rottingdean in the Dec Q 1890 and had four children, Daisy Emily J. Nicholls (Sep Q 1891-Jun Q 1902), Elsie May (Sep Q 1893-Mar Q 1911), Ivy Louise (Jun Q 1899 who m. Harold Lee) Rose Florence (Mar Q 1901) and Dorothy Violet . (1908 who m. Herbert T.Fuller in 1929) . Harry represented the family at the funeral of Albert Jackson in Woking on Dec 31st 1902, presumably escorting his mother in law, Emma Grace, who was also listed among the mourners as 'Mrs Ricketts'. Perhaps he even had transport, not just the train, as he was a brewer's drayman in 1901. 6..Harry Charles was born in 1878 in Brighton. In the Jun Q 1907 he married Harriet Clara Hawthorne, sister of William, his brother-in-law (who had married his sister Emma). They had 2 children Harry William (1908) and Clara May (1911). 7. Louisa Phoebe. was born in the Dec Q 1870. She married John Scarce in the Mar Q 1901 in Brighton and they had 6 children, though one had died, by 1911, the surviving 5 being Leslie Arthur (1902), Stanley Ernest (1904), Ivy Louisa (1906), Honor Margaret (1908) and Frederick G. (1910). (Was the one who died one of twins?) Stanley m. Gladys Rowles in 1926 but there are no further details at present. 8. Rose Eleanor was born in the Jun Q 1882. In 1901 she was working as a shop assistant and still living 'at home' with her mother. As Harry Nicolls and family were also living there, at 29 Foundry St, it must have been quite crowded. In the Mar Q 1911, shortly before the census, she married James Dainty, aged 19, a linen draper's porter, and is listed at the census as only aged 22. 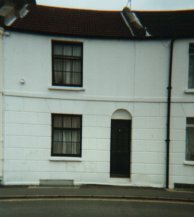 (She was actually 28) They were both living with James' father's family at 7 Hendon St Brighton at that time in another crowded house with 10 people (inc. 4 children and 2 lodgers) in 6 rooms..
10. Ellen Florence was born in Brighton in the Sep Q 1884, so presumably twin to Arthur. She was known as 'Big Nellie'. She married Arthur Mallett and had one daughter, Ellen, also known as Nellie. Nellie junior married A.Locke and lived in Frant, East Sussex, in the mid-20th century. She was widowed fairly early and had no children. She is remembered as a delightful 'bubbly' person. 1826 Emma Wood was born in Kent Rd, Brighthelmstone. daughter of Samuel & Sarah Wood. 1844 Emma Grace was born in Brighton at 8 Regents Row, daughter of James Janes & Emma Wood. 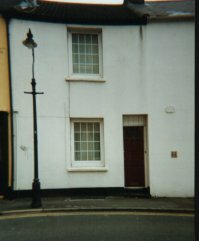 1851 George was living at Merrow St (the centre of the village); Emma Grace was living with her mother, Emma Janes, nee Wood, now a widow at the age of 25, at 1 Marlborough St, Brighton. The census was completely misleading, entering Emma Janes as Emily Jones and Emma Grace also as an Emily Grace Jones. The enumerator was either very hard of hearing or not used to the local accent! Trayton Foord (as spelt then) was a fellow lodger in the house. 1861 George was living on Merrow Common, still with Henry & Eliza, employed as a labourer. 1868 back this time to 29 Foundry St, Brighton for the birth of Fanny; George was described as a 'lamplighter' on Fanny's birth certificate. They were 'still?' there in 1869 for the birth of Sarah Jane. 1875 Samuel was born in 'Guildford' but this should probably be Merrow. 1880 Louisa was born in Brighton. at 31 Vine St, Brighton, parallel with Foundry St but six blocks of small terraced houses nearer to the Steine, were all the Ricketts children except the eldest two..